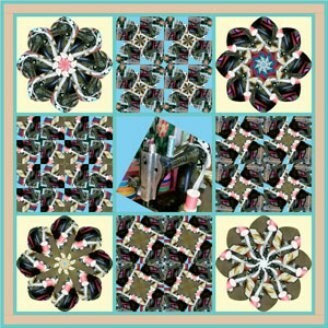 In my photo is a part of the window display from the quilt shop of my friend. I have taken it a little inclined, so I made it upright with the EQ tool Twist on the Image worktable (with blue background). Then I reduced its size with Crop Tool and with changing image parameters (file size reduced 5 times!). And then I could play with the Image Symmetries – both circular and square! Grandma’s Singer – nearly 100 years old!